I suppose I’ve been watching Wheel of Fortune, the game show of hidden words and phrases, to come up with this post title! It’s a “Before and After” line. No really, border prints are my newest fascination this year. 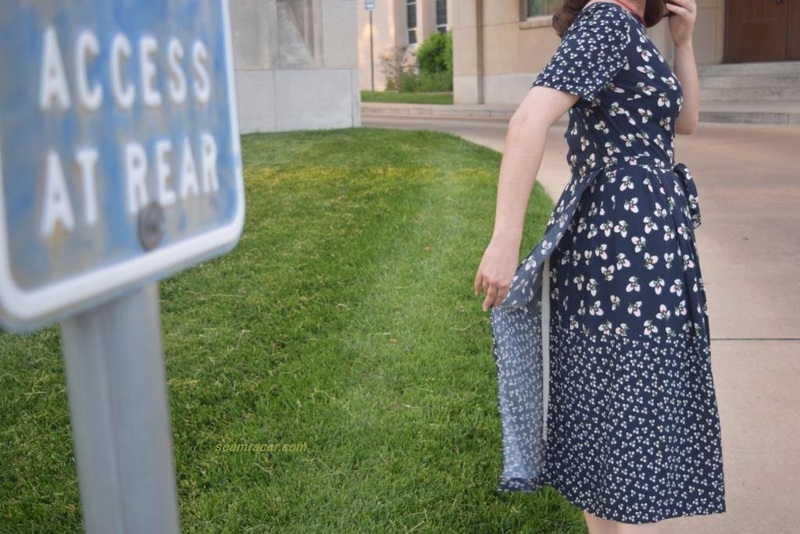 When I’ve combined such a fabric with a wrap-on vintage dress pattern, my post title somewhat sums up the awesome result. 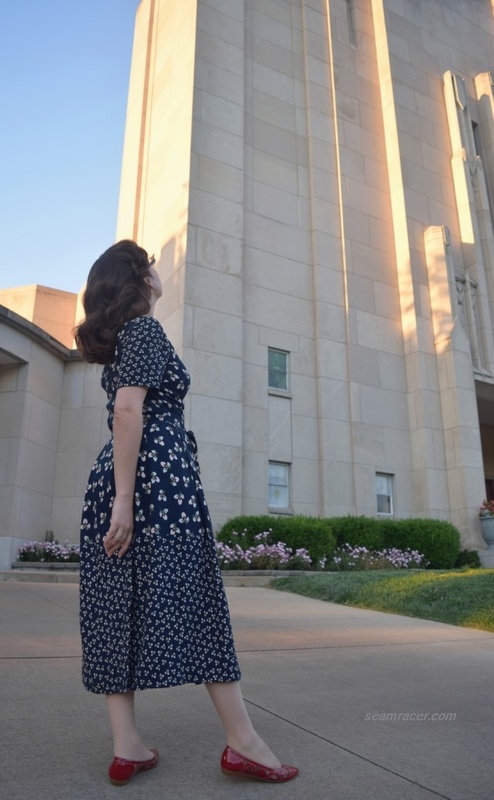 Of all the dresses I have made yet this year, this is the dress that is hands down my favorite – that’s saying a lot! It doesn’t sit in the closet for very long and gets worn almost every other week. It is the perfect balance for me between fun yet classy, professional yet casual, cheery yet uniquely subtle, and totally easy to dress in yet body complimentary. 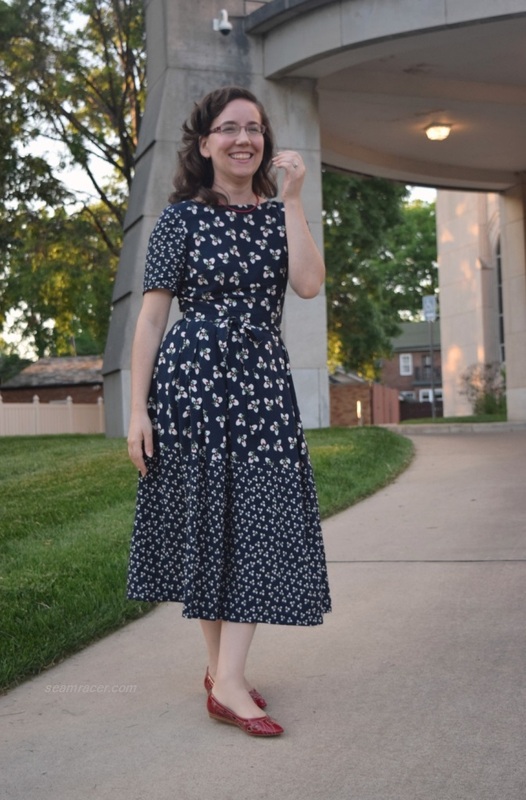 This dress is made with my ultimate favorite fabric –rayon challis – and although it is a wrap dress with no zipper, sewing it was still a very good challenge (which I love). It fits me so well and is comfy as all get out. I think that about covers all I could possibly want out of a dress! TIME TO COMPLETE: My dress was finished on March 21, 2017, after about 7 hours of time spent on it. THE INSIDES: I began by making all seams bias bound, but then I saw a few holes in the rayon so I lost heart to make extra effort on the insides and left the skirt seams raw and unfinished. TOTAL COST: This border print rayon was bought as everything was on clear-out when Hancock Fabrics was going out of business. It was an awesome $2 a yard for about 3 yards – a total of about $6! The fabric is mostly red, white, and navy blue making this my un-official Independence day dress for the “Colors of the Flag Challenge”, also known as the “4th of July Proud Dress Project”. 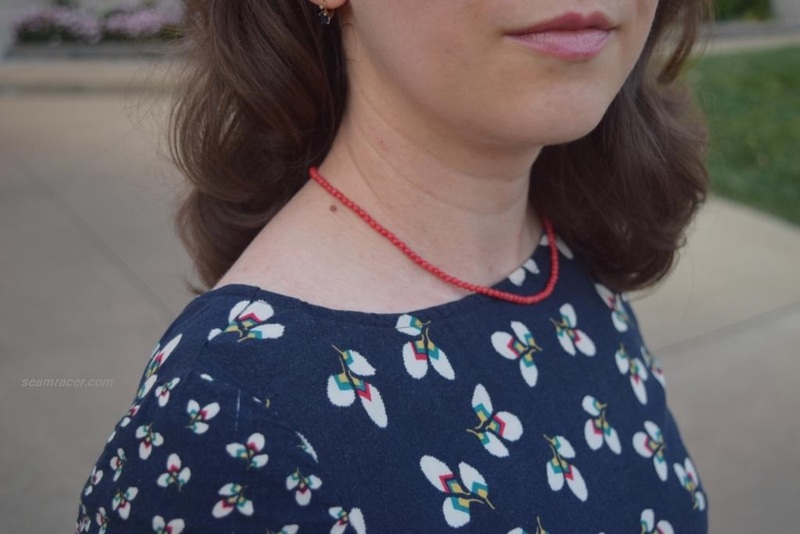 That’s why I paired my red coral bead necklace (made by me, as well) with my comfy and lovely leather B. Makowsky red patent, 60’s style pointed flats. However, there are also small tinges of turquoise and golden yellow. Also, when you look at it, the print is really three leaved clovers, like the wild and neglected greens which grow in my country’s roadsides, cow-fields, and backyards (in our case). Now a plant that gets eaten, stomped on, and neglected has its time to look beautiful. The border print was only printed along one selvedge, and it is just about the widest I have seen (about 20 inches deep). So out of all the inspiration images on my Pinterest board for border prints, I went with a basic layout of keeping the border along the hem and the sleeves. 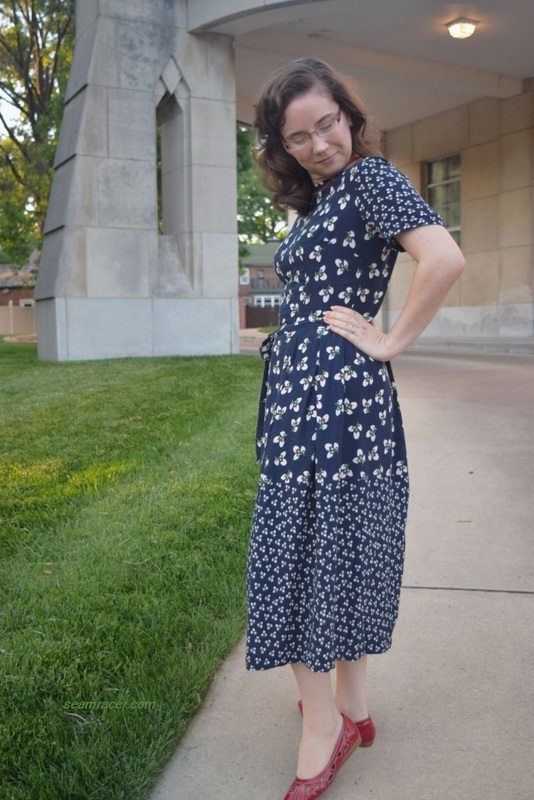 I also, went for a longer midi length to this dress just so I could use as much of the full border print as possible. Now, for being from 1963 this doesn’t look like the conventional 60’s dress does it?! This is a tricky deceiver, again proving to me that the more I look at the early to mid-60’s, the stereotypical hippie style that this era is most known for was certainly not at all around until after the halfway point in the decade. Before 1966, the overall era is still strongly influenced by the 50’s. This wrap-on dress pattern is also something I have had my eye on for the past two years before now. Finally, I can actually have a wearable garment from my long awaited pattern! It was one of those patterns I know I’m intending on buying, only it carries a price tag I’m not willing to accept. So then I wait and selectively stalk the internet every so often just to find one (finally) find at a steal of a price. I have a number of patterns that I’m doing this same ‘waiting game’ for, and I usually do end up finding an awesome deal eventually. The actual sewing was quite easy, but the skirt waist pleats more than made up for that! More on that in a minute, because before that the bodice, it’s facing and sleeves, then the full skirt piece with its pockets had to be sewn together. The ‘side seams’ are not really on the side; they are off each side of the center front. A few inches next to those seams, the pockets get set in like somewhat like a cross between a welt and a button placket. With the skirt piece prepped, I now had one gi-normous rectangle to work with taking up my entire kitchen floor. Now, I have seen a few versions made from this same pattern, and most of them were fails because of the pleats. I totally understand why! The waist pleats tested the limits of my sewing understanding, and were actually blowing my brain. This pattern is so ingeniously designed, but the most amazing details are so low key the dress only has an aura of classy simplicity. To sum things up, a handful of pleats get made first, then another percent of the pleats are made over the ones already made, while rest of the pleats get layered in a opposite direction over only a few of the existing pleats. I needed the skirt pattern laid out just under my fabric skirt so I could mirror the instructions because no amount of marking kept thing straight, and even still I barely made the pleats correctly. At first, the tailoring seems haphazard with no rhyme or reason but once the skirt was on the dress it suddenly made sense. 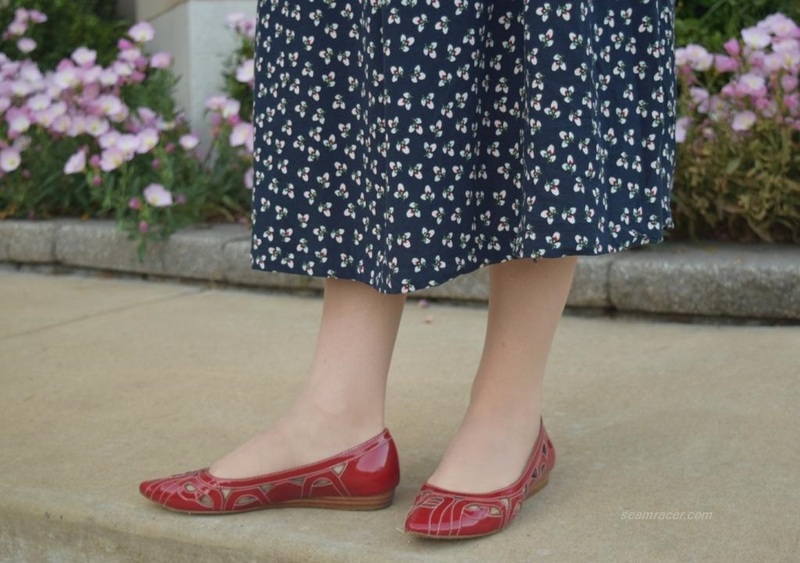 They were all carefully placed, after all – there are two darts at the skirt were it wraps under to keep things smooth, the biggest pleat layers are at the front hips to ‘hide’ the welt pockets, while the most basic pleating is at the back skirt wrap. What I cannot figure out yet is the pouf of the pleats seen on the cover – perhaps that ‘look’ comes with a petticoat or using a stiffer fabric? There are a few details worth noting about this pattern, so that if you do snag your own version –and I recommend you do – you will be informed. First of all, the bodice is quite long compared to other 60’s era patterns. I realized that fact only after I was finished with the dress. It is really close enough to not be something causing me to unpick and re-sew or detract from my overall fit. As long as I keep decently good posture (which I should be doing anyway!) the waist is at a pretty good spot, but for my next version (Yes! It will be in cotton, too) I will shorten the bodice at the middle. The center front neckline, for as high as it already is on me, was actually lowered by about ½ inch. As much as I love a beautiful boat neckline, this is again something I am ok with as it is, but will slightly change and re-draft differently next time. Finally, the V-back neckline does have the tendency to gape open and droop off the shoulders without some sort of small help. My immediate step was to add snap-closed lingerie straps at the tiny shoulder seams to hook onto my underwear. However I wanted another option not including anchoring the dress to my lingerie, so I sewed the tiniest size hook-and-eye that I had to the back neckline edges where they cross. The hook-and-eye was sewn just underneath and at an angle to the very edge to keep a natural, un-recognizably “tacked down” appearance to the back neckline, and they are just enough that I really don’t need to use the lingerie straps. Yay! Fitting crisis averted, style lines kept unaltered, and easy fixes found. Although this wrap dress hasn’t got a zipper, it does end up having a great fit I never thought possible with a garment that just is thrown and tied on! This is a project that definitely made me ‘work’ in a good way for a final garment that I love and feel proud wearing. 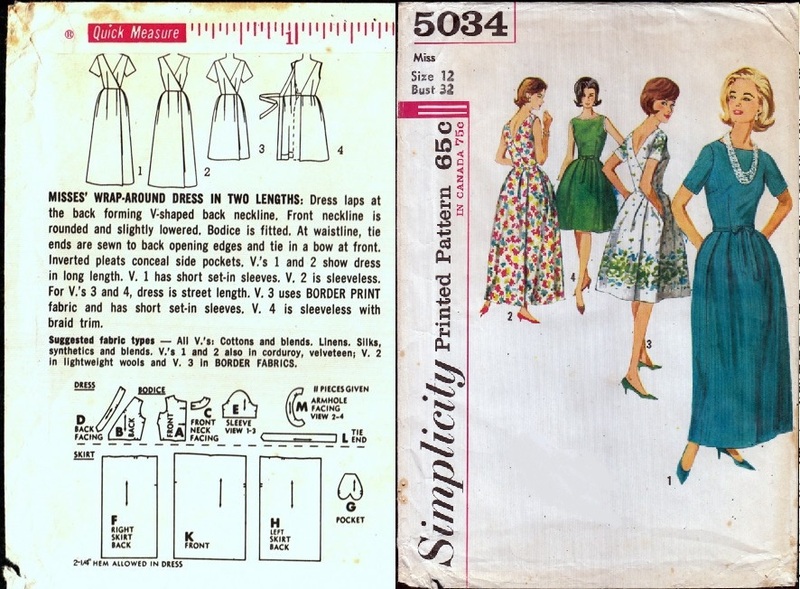 I would have never guessed a dressy house frock would have given me such a challenge but that is the awesome beauty of using vintage original patterns. They always have much more than meets the eye…you just have to dive into them to find what good surprises they have to offer. Speaking of surprises, my dress doesn’t exactly have as much of an overlap to the wrap as I would have liked and it does sort of open up to a ‘surprise’ flash when the wind blows. Sometimes I safety pin the flap down, but most of the time I don’t…and then this can happen. I hope the secret message of this photo tells all! 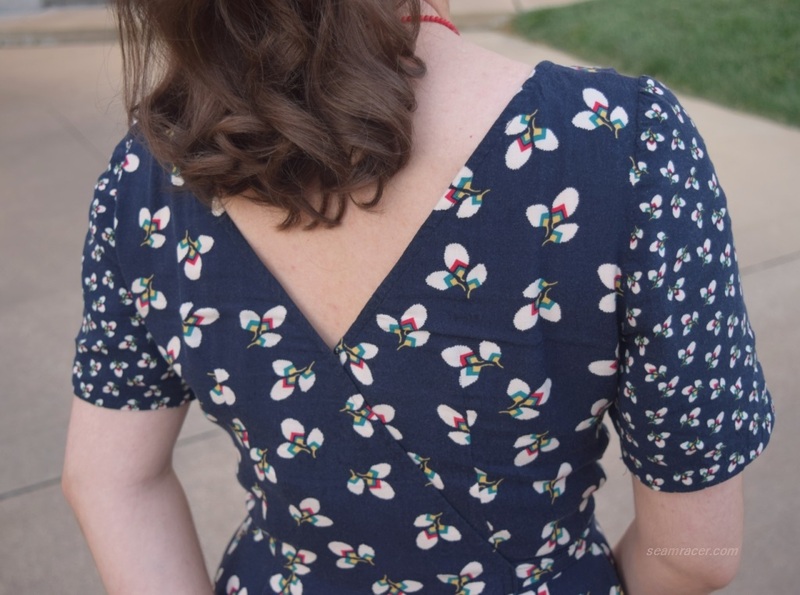 This entry was posted in 1960's and tagged "rayon challis", "Simplicity pattern", "wrap dress", 1960's, 1963, 4th of July Proud Dress Project 2017, back wrap dress, border print, border print dress, clover print fabric, Colors of the Flag Challenge 2017, dress, pleated skirt dress, pleats, retro, sewing, Simplicity 5034, vintage, vintage border print dress by kellycb. Bookmark the permalink. I love border print dresses. This is a very clever wrap dress. I didn’t notice it was until I got into the details!